PA Picks – Looking to Live the Country Life? 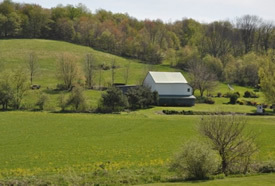 Ever think of trading in your city digs for life in the country? Many metropolitanites dream of foregoing the bright lights and late nights of the urban scene to be surrounded by more peaceful climbs with rolling hills and green pastures. This week we’re taking a look at idyllic farms that fulfill the requirements of the country relocation dream.